· Thickens and strengthens hair. · Promotes Healthy bones and joints. 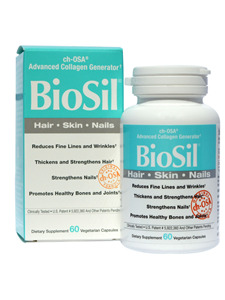 BioSil Hair Skin Nails, with clinically proven ch-OSA, is specially formulated to help nourish your body's 3 beauty proteins and restore them to more youthful levels. ch-OSA has been tested in rigorous double-blind placebo controlled clinical trials for both efficacy and safety. The results are published in peer reviewed medical journals. This product does not contain soy, dairy, egg, corn, wheat, gluten, fish/shellfish, nuts/tree nuts. Q. What is “orthosilicic acid”? A.It is the only bioavailable (readily usable by the body) form of silicon. Orthosilicic acid is absorbed directly through the gastrointestinal wall and distributed through the body in the bloodstream. Q.I have heard that drinking green tea along with my supplements will end up flushing out all the nutrients? Is this true? A.No, you are fine taking your supplements with green tea. Coffee inhibits the absorption of nutritients, but the caffeine in green tea will not pose the same problem. Q.Can you tell me if I can combine any of your supplements with the medication(s) I am on, as prescribed by my doctor? A.It is best to consult your Doctor or alternative Health Practitioner before taking any new supplements while on medication.